This is Part 3 of our Peru Itinerary. You can find the rest here: Part 1, Part 2, Part 4, Part 5. 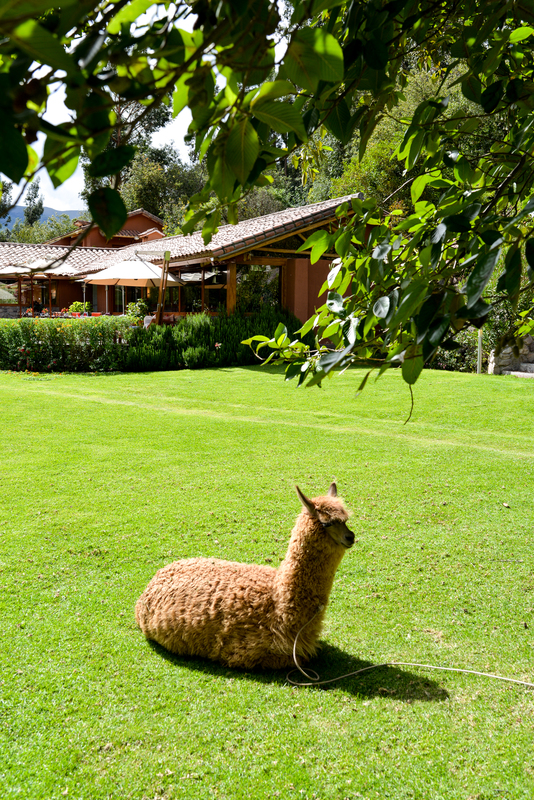 Our trek to Machu Picchu began an hour’s journey into the countryside west of Cusco in the Sacred Valley of the Incas. 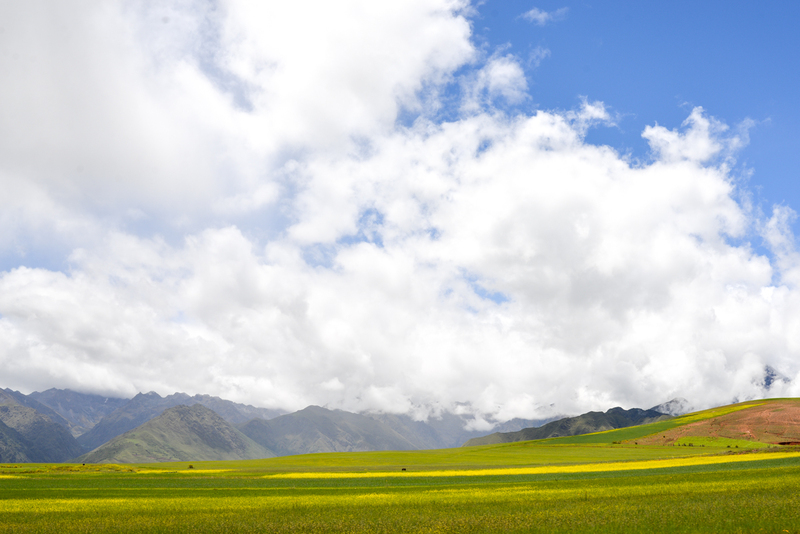 We hired a taxi to take us from Cusco to the Sacred Valley, passing through verdant pastures that gradually gave way to rising Andes mountains during the 90 minute drive. It was rainy so we didn’t get out for pictures, but the rain had it’s own beauty to it and fed the bright fields of purple lupine and yellow mustard. Near the end of the ride, we reached the highest point and caught our first glimpse of the town of Ollantaytambo in the valley below. 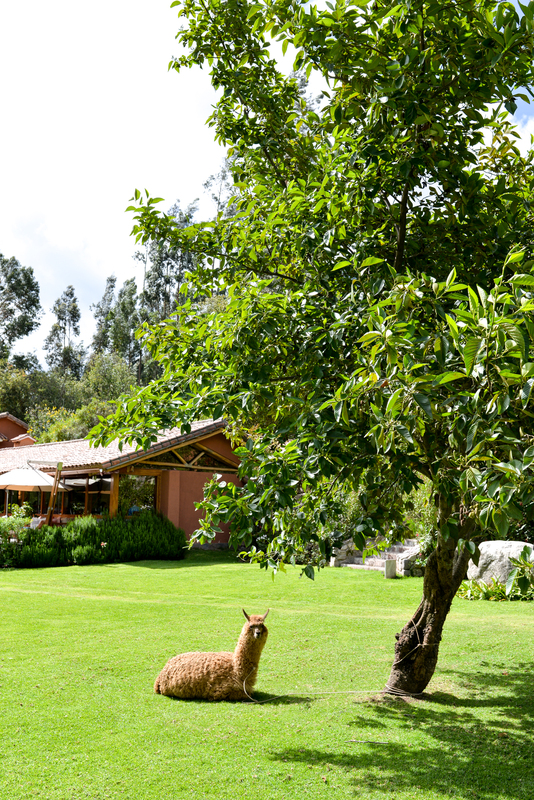 We made our way down into the river valley passing local tuk-tuk taxis and fruit vendors on the narrow road to our staging destination to Machu Picchu: Belmond Hotel Rio Sagrado. 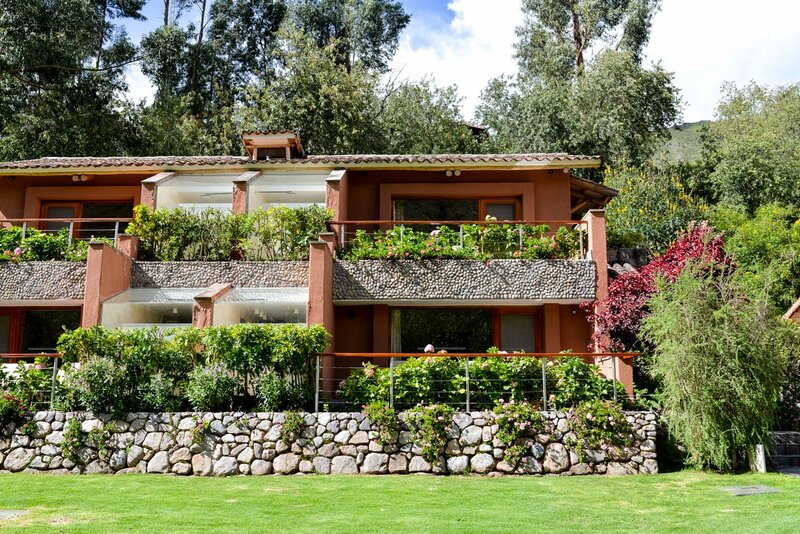 Belmond Hotel Rio Sagrado is hidden along a stretch of the Urubamba River, away from the bustle of town. It took our driver a few minutes to identify the entrance, as we had to explore several narrow backroads before finding the right route to the hotel. We checked in and enjoyed a signature herbal tea derived from local plants before hopping in a golf cart to head to our room. 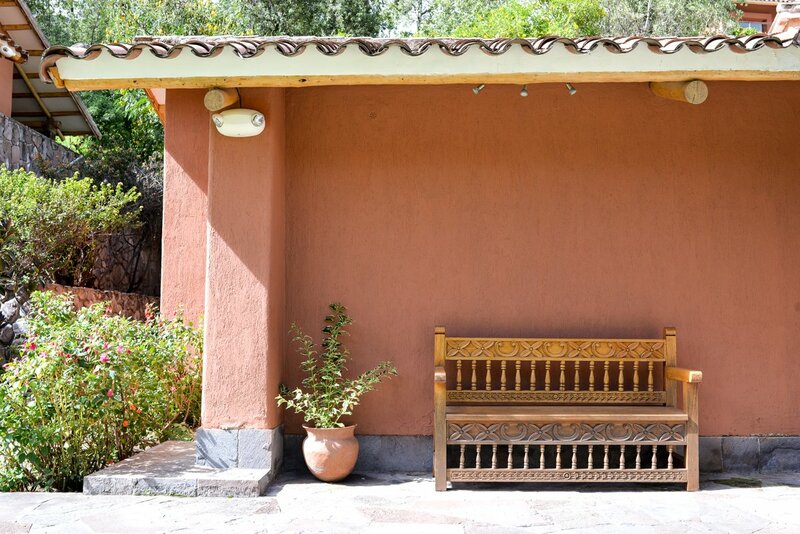 The property is lush with hanging gardens and cascading walls of pink, white and red flowers. 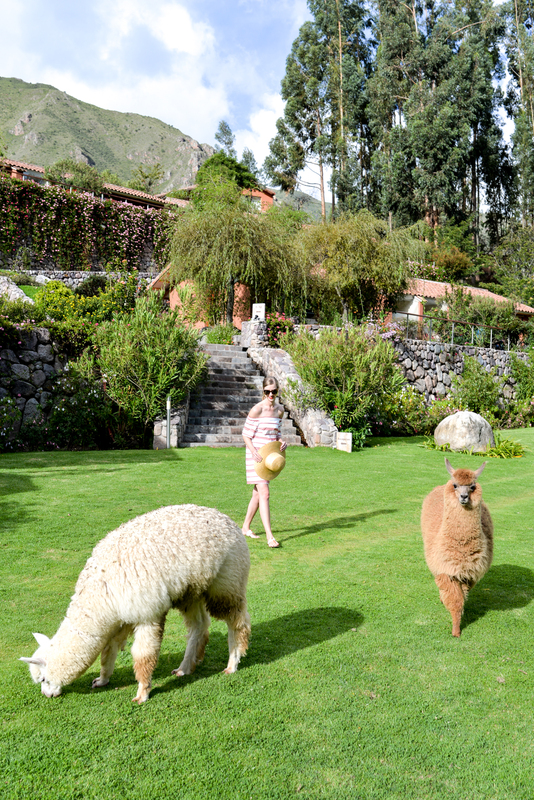 Below us on the great lawn were two alpacas grazing in the afternoon sun. Our room looked out to the river from an expansive terrace, and sounds of a bubbling brook could be heard from the small natural spring right of our room’s entrance. We felt immediately relaxed – and welcomed as if to a friends home, with the sweet desserts and personal letter from the manager explaining the property’s spiritual history. For the Incan People, The Sacred Valley was revered as a sacred reflection of the Milky Way above in the celestial skies. David spotted a hammock near the water, and we decided to take a moment to swing and reflect on our journey thus far. 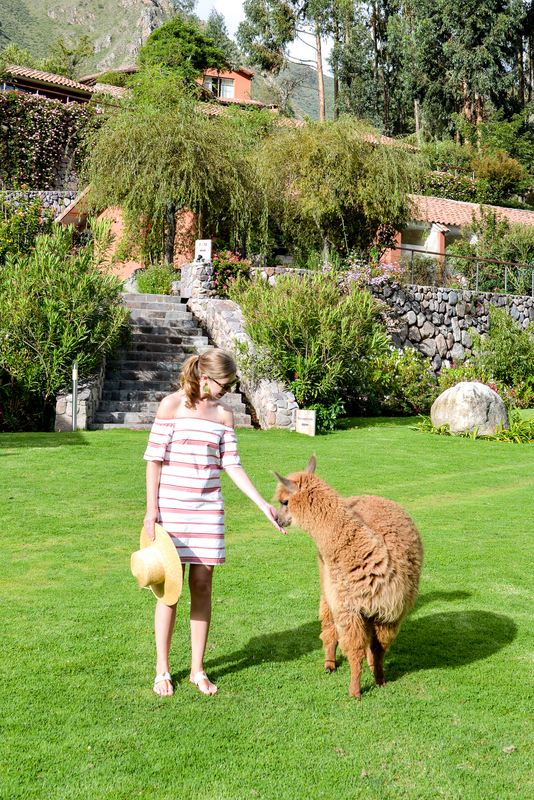 The unexpected highlight of our day was feeding the hotel’s resident alpacas. 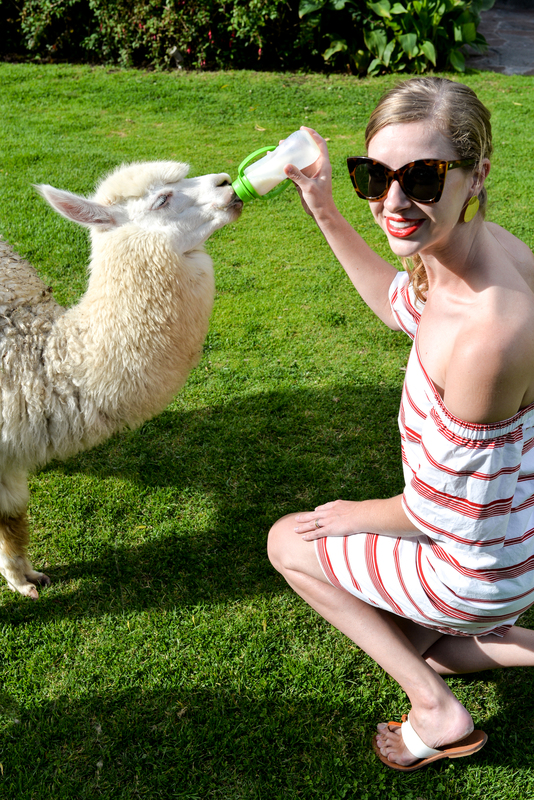 Only one other family with a toddler showed up to give the alpacas their bottles of milk, and I was much more excited about the opportunity than the toddler. I couldn’t stop laughing as they chugged their milk, polishing off the bottles in less than two minutes with their eyes closed, long lashes fluttering. 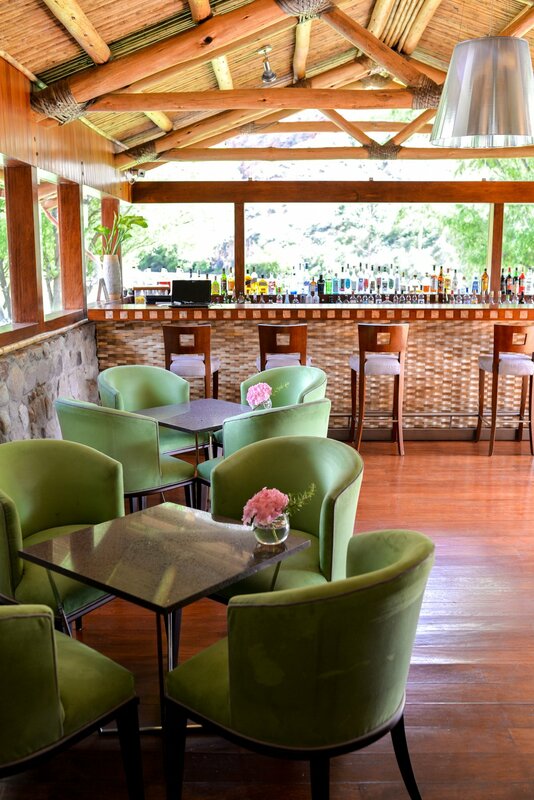 That evening as the sun set, David and I walked across the great lawn to El Huerto, the hotel’s restaurant. 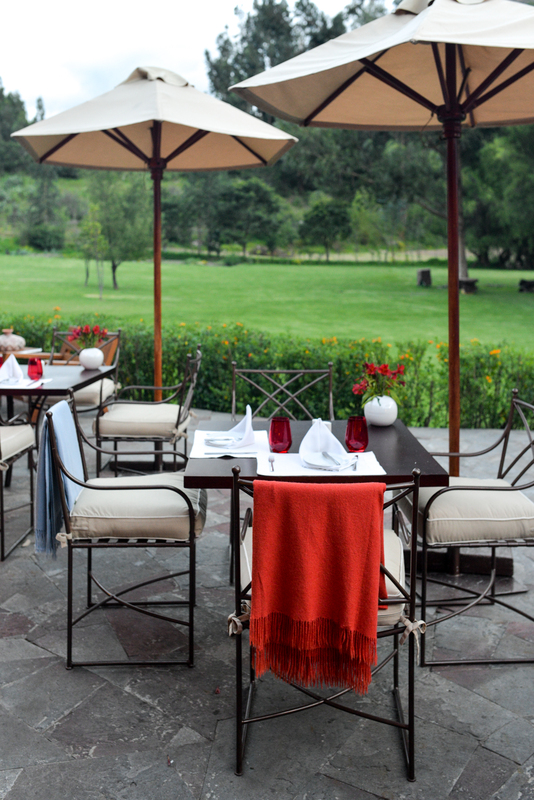 In good weather, food is cooked over a wood fire outside near the patio. 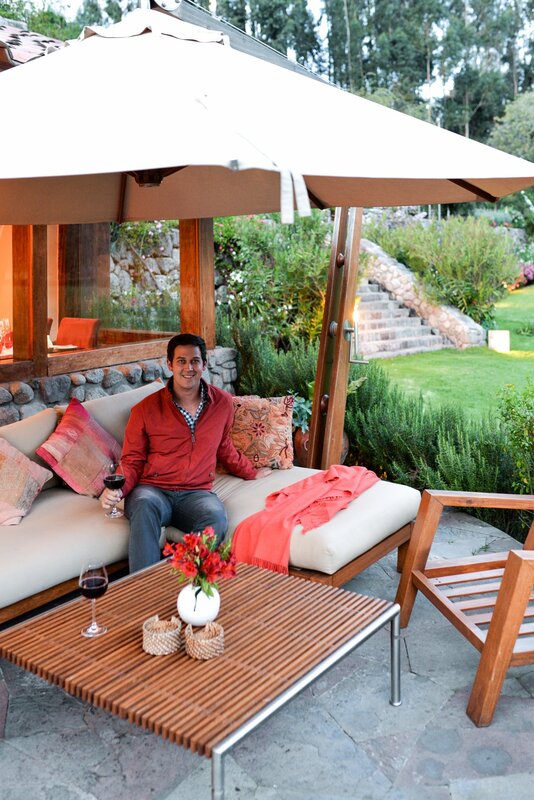 We chose an outdoor seat with views of the river and the fire, settling in with a glass of Cono-Sur, a delicious pinot noir we discovered while in Chile, and wrapped in an alpaca blanket to guard against the chilly night air. 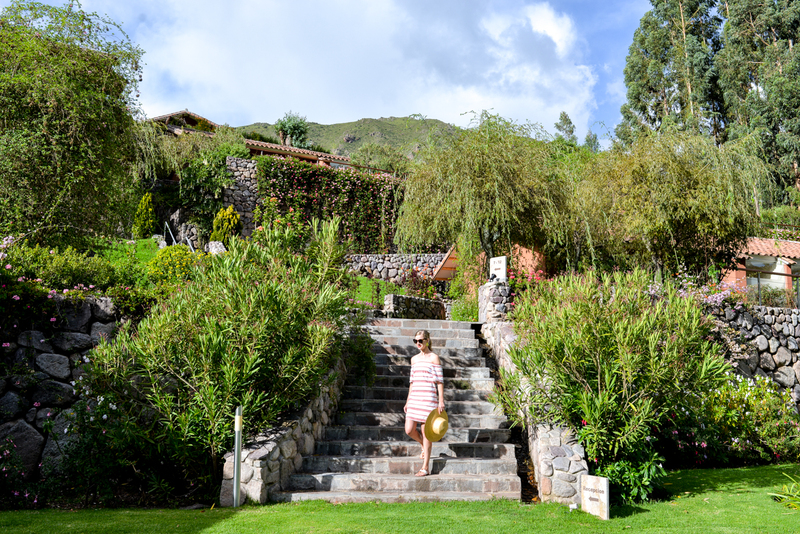 While daytime was warm enough to enjoy the pool, evenings in the Sacred Valley can be crisp, and we were thrilled to find hot water bottles (with cute lamb coverings) warming our bed when we returned from dinner. In the morning, we awoke early to the distant sound of the Hiram Bingham train arriving. We packed our bags and waved goodbye to the Hotel Rio Sagrado, as we walked to the train entrance. 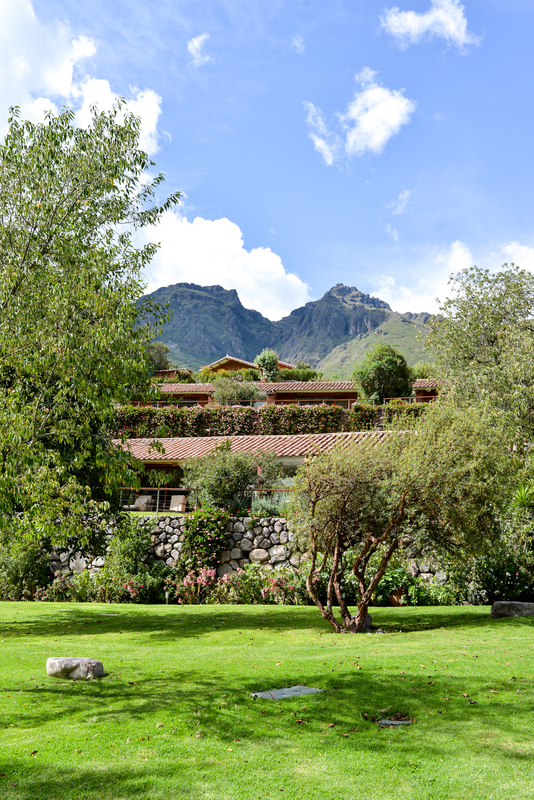 The Hiram Bingham train stops at a private station at the entrance to Hotel Rio Sagrado, so when we exited the hotel, we were greeted by a chorus of traditional Peruvian music beckoning us to Machu Picchu on the legendary Hiram Bingham train. Thank you Belmond Hotel Rio Sagrado for such a lovely stay! 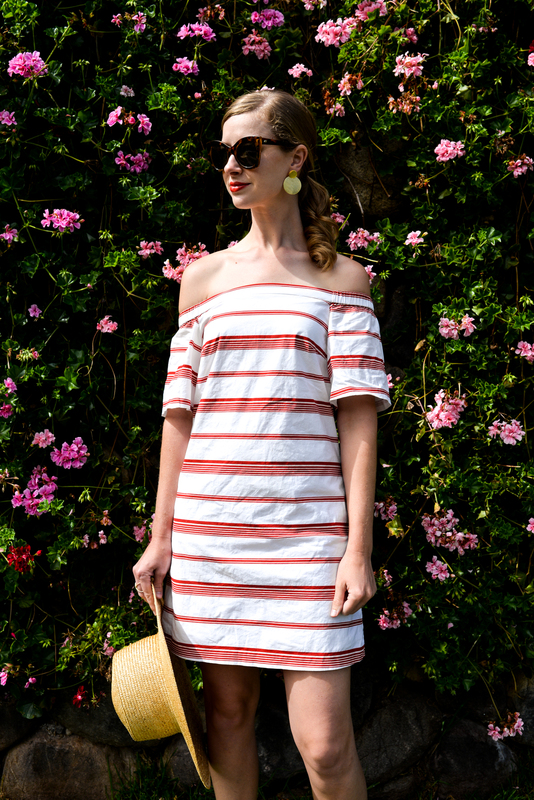 Photos by David and Stacie Flinner for stacieflinner.com.